To evaluate total, energy-adjusted dietary fiber (DF), water-soluble fiber (WSF), and water-insoluble fiber (WIF) intakes in European adolescents and to investigate their association with indicators of adiposity and serum biomarkers. 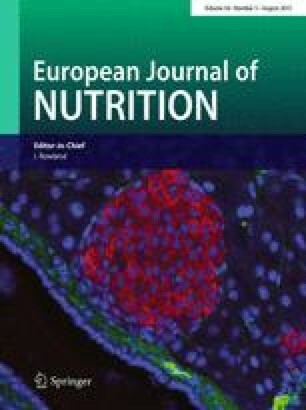 This study, conducted from 2006 to 2007, included 1804 adolescents aged 12.5–17.5 years (47 % males) from eight European cities completing two non-consecutive computerized 24-h dietary recalls. GLM multivariate analysis was used to investigate associations. Mean DF intake (20 g/day) of the sample met the European Food Safety Authority recommendation, but was below those of the World Health Organization and of the Institute of Medicine. Total DF, WSF and WIF intakes were higher in males (P < 0.001), but following energy-adjustments significantly higher intakes were observed among females (P < 0.001). Bread and cereals contributed most to total DF, WSF and WIF intakes, followed by potatoes and grains, energy-dense but low-nutritious foods, fruits and vegetables. Moreover, energy-adjusted WSF and WIF were positively associated with body fat percentage (BF%), waist to height ratio and low-density lipoprotein cholesterol, while energy-adjusted WSF was inversely associated with serum fasting glucose (β = −0. 010, P = 0.020). Total DF intakes are rather low in European adolescents. An inverse association with serum fasting glucose might indicate a possible beneficial role of DF in preventing insulin resistance and its concomitant diseases, even though DF intakes were positively associated with adolescents’ BF%. Therefore, further longitudinal studies should elaborate on these potential beneficial effects of DF intake in the prevention of obesity and related chronic diseases. The HELENA-study took place with the financial support of the European Community Sixth RTD Framework Programme. This work was also partially supported by the European Union, in the framework of the Public Health Programme, the Swedish Council for Working Life and Social Research, the Spanish Ministry of Education, Spanish Ministry of Science and Innovation (AGL2007-29784-E) and the Spanish Ministry of Health, Maternal, Child Health and Development Network. The content of this paper reflects only the authors’ views and the rest of HELENA-study members and the European Community is not liable for any use that may be made of the information contained therein. Yi Lin was responsible for the analyses and the drafting of the manuscript. Many thanks to Petra Pickert, Anke Carstensen, Rosa María Torres for their contribution to laboratory work. All authors contributed to the interpretation of the results and have evaluated and approved the manuscript as submitted.